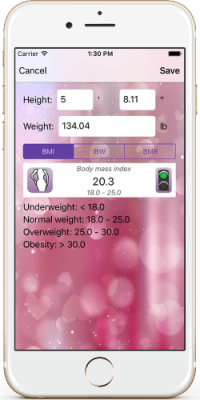 BMI application allows to calculate such indices as calories daily intake, BMI, IBW, BMR. Body mass index is a measure of body fat based on height and weight that applies to men, women, children and teens. Basal Metabolic Rate is an estimate of how many calories you'd burn if you were to do nothing but rest for 24 hours. It represents the minimum amount of energy needed to keep your body functioning, including breathing and keeping your heart beating. You needn’t waste time for difficult calculations, just get the height and weight, and with the help of BMI watch for vital signs.